Contact lenses require great care for maximum cleanliness and comfort, but if you’re using the wrong contact lens solution, you may be left with eyes feeling dry, tired, and extremely irritated! If you’re struggling with your current solution, check out these 7 best contact lens solutions below. They’ve proven themselves to be top-of-the-line solutions that will keep your lenses clean and keep YOU comfy! Clear Conscience Multi-Purpose Contact Lens Solution sets itself apart from the rest in a way that will make you feel comfortable and let you rest easy. 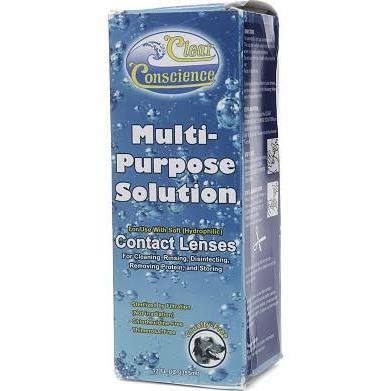 Unlike other popular contact lens solutions, Clear Conscience Multi-Purpose Lens Solutions is made with only natural ingredients, free of scary chemicals typically found in a contact lens solution like thimerosal and chlorhexidine. Perfect for hydrophilic contact lenses, this solution easily and gently cleans, rinses, disinfects, and removes unnecessary proteins for a perfect solution that works every time. Go all natural for only $9.99! Struggling with sensitive eyes? 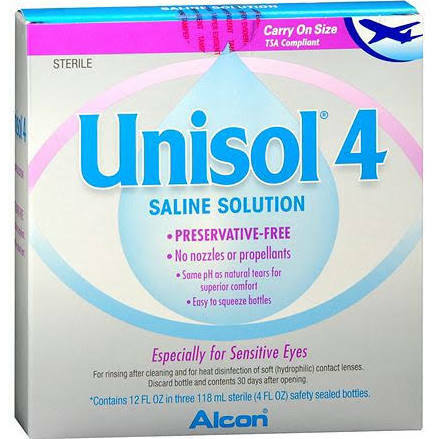 Unisol 4 Preservative Free Saline Solution is your answer. This preservative-free saline solution comes in an easy-to-squeeze bottle for maximum convenience while a solution made of the same pH as natural tears leaves you with maximum comfort. For incredibly soft contact lenses that are gentle on the eyes, try Unisol 4 Preservative Free Saline Solution today for only $7.99. What a steal! 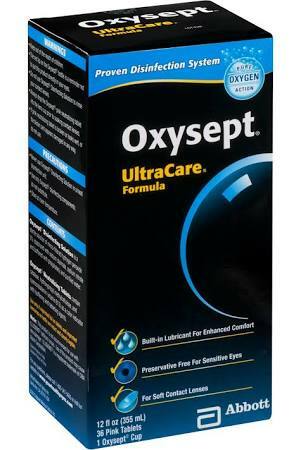 Providing users with “Pure Oxygen Action”, AMO Oxysept Disinfecting Solution is not only a wonderful choice when it comes to enhanced comfort and super soft lenses, but for extreme disinfecting as well. This contact lens solution provides powerful protection against all types of microorganisms and harmful bacteria, leaving you with clean and sterile contact lenses you can feel comfortable about. Touted as the “ONLY peroxide system with a built-in lubricant which retains and seals in moisture”, you can rest assured your lenses will be flawlessly soft each and every time. Sells for around $10! RevitaLens OcuTec Multi-Purpose Disinfecting Solution does it all. Specifically formulated for soft contact lenses (including silicone hydrogel lenses! ), this amazing solution sterilizes, cleanses, rinses, disinfects, stores, AND removes protein, all at the same time. A specially formulated solution delivers supreme comfort for your eyes while delivering effective cleansing and disinfecting for outstanding lenses every time. This product sells for around $13, well worth the price for over 16 hours of absolute comfort! Sensitive to added chemicals found in the majority of multi-purpose solutions? Experience a lot of dryness and irritation of the eyes, specifically associated with your contact lenses or current solution? 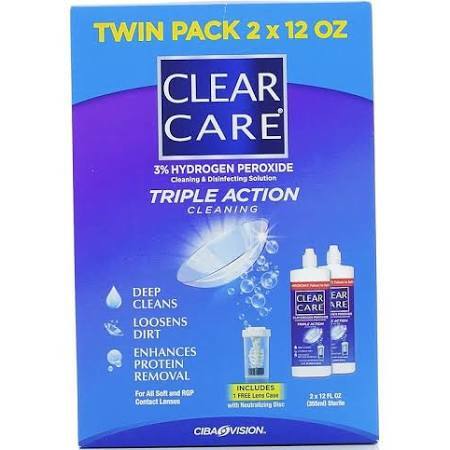 Then Clear Care Triple Action Cleaning & Disinfecting Solution is the contact lens solution for you! This highly effective solution is designed with a hydrogen peroxide base that you can visibly see working right before your eyes! Hydrogen peroxide provides a bubbling action that quickly and easily removes dirt, build-up, protein, and harmful germs and bacteria that could lead to a serious problem. If you’re dealing with sensitive, dried out eyes and want a product that will get the job done, consider this one for around $10! 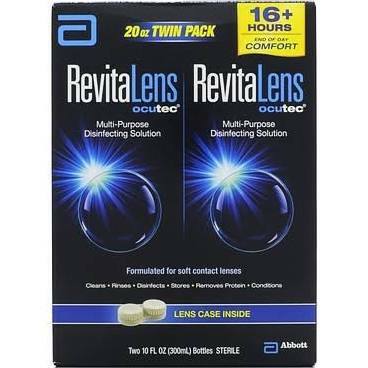 Great for soft hydrophilic lenses AND rigid gas permeable lenses. 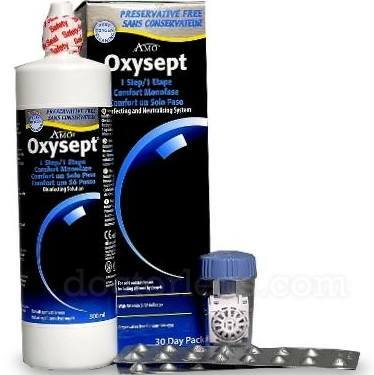 Referred to in the industry as the “ultimate in lens hygiene”, Abbot Oxysept 1 Step Solution for Soft Contact Lenses makes it easy to completely clean and disinfect your lenses for ultimate cleanliness and clarity. The uniquely designed formula not only disinfects with a peroxide based solution for maximum killing of germs and bacteria, but also contacts a neutralisation process for even better cleansing. With the inclusion of lubricant in this preservative free solution, contact lenses are left feeling super soft, amazingly comfortable, and one hundred and ten perfect CLEAN! An amazing one step product for only $14! 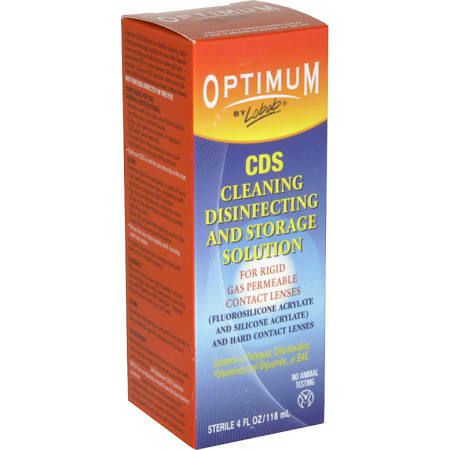 Now here’s one specifically designed for those out there with rigid gas permeable lenses or hard contact lenses: I proudly introduce you to the Optimum CDS Cleaning, Disinfecting, and Storage Solution. This wonderful solution is easy to use and is a 3-in-1 product that cleans, disinfects, and stores your contact lenses for perfect results every time. Solution easily removes excess film, any surface deposits and debris for perfectly cleaned lenses you’ll love. All for under $10! What’s your favorite contact lens solution?